Abbey Scaffolding are fully qualified to cater for all your scaffolding requirements, both commercial and residential. 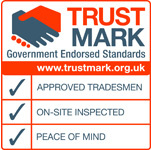 We offer excellent standards in customer care and health and safety is our number one priority. Abbey Scaffolding are based in North Wales and have been trading since 1995 and became a Ltd company (Ffynnon Wen Ltd) in December 2005. We offer all aspects of Scaffolding, Safety and Debris Netting, Security Fence Panels (Anti-Climb) for the Private and Commercial Sector. We provide free, competitive quotations and assure you of our high standards of work, at all times. Staff training and health and safety are always paramount within our business. Many of the Abbey scaffolding team are trained to advanced level. This has helped to make our company well respected in our area which covers all the North Wales Coast and Chester. We are CITB registered, with qualified staff holding CISRS and CSCS cards. Our contracts include same day erect and dismantle emergency work for Scottish Power and we cover a large area for Everest.